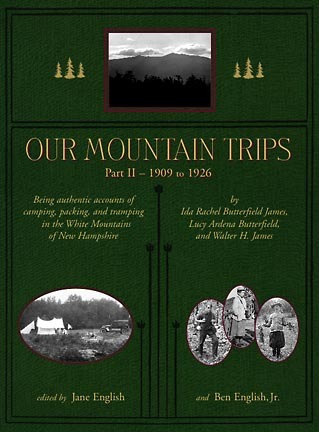 Our Mountain Trips: Part II - 1909 to 1926, edited by Jane English and Ben English, Jr., 2007. The second and final installment of the fascinating hiking and camping journals and photos created by early 20th century trampers Walter and Ida James and Lucy Butterfield. Among the three dozen excursions described here are treks to the Great Gulf, the Carter Range, the Bonds and the East Branch country, the Davis Path and Rocky Branch area, Mt. Washington, the Northern Presidentials, Mt. Chocorua, the Albany Intervale, and the Sandwich Range. The hundreds of photos include images of early versions of the Perch, Guyot Shelter and other popular camping spots. 192 pp, 8 1/2" x 10 1/2."